Photo above: Sen. Andrew Serafini and Justin Ready on the House rostrum. Republican Dels. Justin Ready of Carroll County and Andrew Serafini of Washington County got appointed by the governor and sworn in to their new Senate seats so fast on Monday that they didn’t have time to bid farewell to their former House colleagues till Tuesday. Over in the House, Speaker Michael Busch teased the late-to-arrive senators about their tardiness as delegates awaited their arrival. “Unfortunately they’ve been in the Senate one day and they can’t find their way back,” said Speaker Busch, bringing a round of laughter from delegates. Sen. Justin Ready echoed Serafini’s thanks to the chamber, going on to tell the freshmen delegates how his experience with the House helped to mold his political values. “Why they would want to leave is beyond me,” quipped Busch, who has served 28 years in the House, 12 of them as speaker. Serafini and Ready replaced two senators now serving on Gov. Larry Hogan’s staff. Serafini replaced Sen. Chris Shank, now head of the Governor’s Office of Crime Control and Prevention. 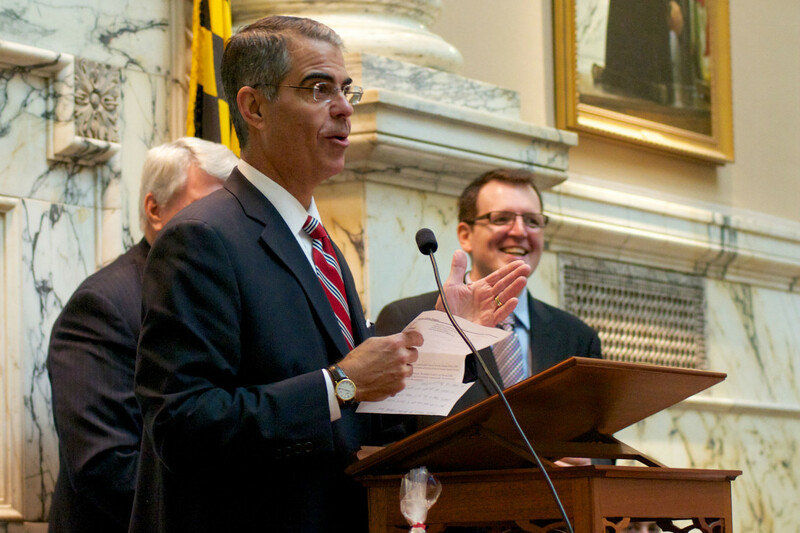 Ready replaced Sen. Joe Getty, now Hogan’s legislative and policy director. Both their House seats will now need to be filled with nominations by the Republican Central Committees in their counties. New Frederick County delegate Barrie Ciliberti was sworn in Wednesday morning to replace Del. Kelly Schulz, the new secretary of Labor, Licensing and Regulation.